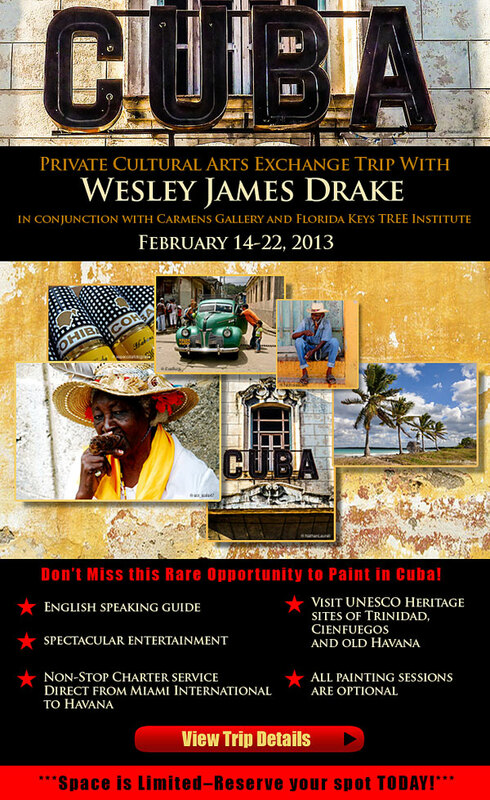 I am thrilled to be leading an arts exchange trip to Cuba on Feb 14 - 22, 2013. 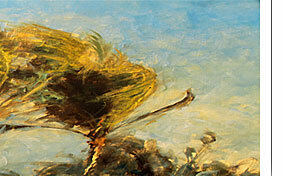 This trip has been planned under the direction of the Florida Keys TREE Institute. The founders of this institute have been running successful trips to Cuba for quite some time and now we're adding art instruction to the mix. The painters in the group will be painting under the instruction of Chicago artist and carmen's gallery artist Wesley James Drake. I hand chose Wes to lead this expedition, not only because he is one of our favorite painters, but because he is so well traveled and can adapt to any environment. He's also a great guy! We also have quite a cultural experience planned for the leisure travelers who don't want to paint, but who want to experience the art and culture of Cuba. You are receiving this because you have expressed an interest in this trip, which is available only by referral. We will be visiting art studios of Cuban painters in Trinidad, painting on the beach at Cienfuegos, and enjoying private tours of artists' studios in Havana as well as being taken on a private tour of the Havana Museum of Art. And, that is only the beginning! There will be daily opportunities to paint with Wes Drake, but if you would rather take advantage of the non-painter activities, that's fine, too. The agenda that I'm attaching is very flexible. You will have a wonderful opportunity to visit with the locals and experience a country that very few Americans have legal access to. I took advantage of the opportunity to visit CUBA with a humanitarian exchange program led by this group 2 years ago, and I'm back for more. It was unforgetable and to think that we can experience that AND paint...I can't wait! The trip is limited to 26 people and it's first come, first served. All of the VISAS and documents required, including boarding passes, etc will be taken care of for you. You MUST have a current American passport to go on this trip. Please review the attached agenda and call me or email me for further information or clarification. For the leisure travelers, there are many excursions that you can take advantage of. For anyone coming to paint...Although Wes is an oil painter and will be using that medium, the instruction will be relevant for any medium. Or, if you want to just paint with no instruction, you can do that, too. I am so happy to be able to coordinate this arts exchange trip and hope that you will be one of the fortunate ones to join us. Thanks so much and I look forward to hearing from you if you're interested. This year celebrating our 31st year on Solomons Island (chosen by Coastal Living Magazine as One of the Top 15 happiest seaside towns in the U.S.)! Voted "Best Art Gallery on the Chesapeake Bay" 3 years running! After breakfast at the Hotel, a morning trek to the base of the Escambray mountains to a waterfall and tropical forest for some environmental subject matter Morning sketching session. Return to hotel for lunch. The afternoon is full of choices! Head back to Trinidad City or paint on the beach. Afternoon painting session. 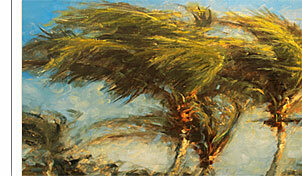 Non- painters can enjoy the beautiful Caribbean or head back to the City. Farewell to Trinidad dinner. Please note that itinerary is subject to some alterations for reasons beyond our control. Cuba has a tendency to shut down sites without advanced notice due to lack of utilities or for emergency repairs. However, we will substitute an experience that is equal or better! Holy Trinity Cathedral was completed in 1892, replaced the original 17th-century church that was destroyed in 1812 by a hurricane. The new construction is rather simple on the outside, but the restored interior reveals a Gothic vaulted ceiling and nearly a dozen attractive carved altars with unique statues and paintings. There are only two depictions of Jesus Christ sitting in the world and one of them is here. The cathedral can be visited Monday through Saturday from 10:30am to 1pm. The highlight of the Plaza Mayor, and the most evocative reminder of Trinidad's glory days, is the lovingly restored Palacio Brunet, Fernando H. Echerri 52 at the corner of Simón Bolívar. The colonial mansion dates to 1704 (the second floor was built in 1808) and houses the Museo Romántic. Its splendid collection of period antiques culled from a number of old Trinitario families convincingly evokes the life of a local sugar baron in the 1800s. Don't miss the enormous kitchen, covered in azulejo (glazed ceramic tiles), with a wood-burning stove. The views from upstairs are marvelous. The museum is open Tuesday through Saturday from 9am to 5pm and Sunday from 9am to 1pm. Admission is CUC$2; allow about 45 minutes for your visit. Museo de Arqueología features a collection that encompasses natural sciences and pre-Columbian Cuba. It's mostly an uninspired hodgepodge of exhibits, though; you'll find bones of Indian natives and slaves, glass-enclosed stuffed animals, and a 19th-century kitchen, which, though interesting, is hard to classify as either archaeology or natural science. The former Palacio Cantero, an 1830 palatial residence built by a noted sugar baron, houses the Museo Histórico Municipal, Simón Bolívar 423 between Peña and Gustavo Izquierdo. In addition to antiques and 19th-century furnishings, there are bits and pieces of slave history, old bank notes, and exhibits of revolutionary Cuba. For many visitors, though, the highlight is the climb up the narrow and rickety wooden stairs to the tower, which has terrific bird's-eye views of Trinidad and the surrounding area. The museum is open Saturday through Thursday from 9am to 5pm; admission is CUC$2. Allow about an hour for your visit, a bit longer if you want to linger over the views. The second of Trinidad's two major towers is the picturesque, yellow-and-white domed bell tower belonging to the former 18th-century Convento de San Francisco (Convent of Saint Francis of Assisi), Fernando H. Echerri at Piro Guinart. Today the building hosts the dogmatic, but rather fascinating Museo de la Lucha Contra Bandidos, which focuses on revolutionary Cuba and the continuing "struggle against bandits." Exhibits document Fidel's battles against counterrevolutionaries -- the bandidos in question -- who sought to overturn the regime's ideals by winning support among guajiros (poor rural farmers) and fighting in the Sierra del Escambray in the 1960s. In addition to newspaper reports, you'll find machine guns, military maps, a CIA radio, and photos of the ragtag principals who finally, and quite extraordinarily, overthrew the Batista government in 1959. As is the case with the Museo Histórico, though, the biggest draw may be the panoramic views from atop the bell tower. The museum is open Tuesday through Sunday from 9am to 5pm; admission is CUC$1. Allow 45 minutes or so, including the visit to the tower. Florida Keys TREES Institute invites you to experience our Sister Island through a humanitarian exchange program by our 501 © 3 nonprofit organization. Share a true “People to People” exchange of shared love for the arts, culture and the environment. This exceptional art and learning experience will include visiting the magical, the UNESCO (United Nations Educational, Scientific and Cultural Organization) Heritage sites of Trinidad, Cienfuegos and old Havana. While there, you will learn about the art and architecture of these historical cities and have an opportunity to personally interface with local artists, sculptors and architects of this region. Each package includes: complimentary conference call debriefing 4 weeks prior to the journey, Miami hotel, round trip non-stop CHARTER AIR service direct from Miami International to Cienfuegos with return from Havana to Miami, private air-conditioned motor coach, four and five star accommodations, special travel visa, approved license, all tips*, luggage handling throughout the trip, all transfers & fees, English speaking guide, spectacular entertainment, and meals as stated on the itinerary. The first 4 days of this trip include all meals, all drinks at the all inclusive hotel. All painting sessions are optional. Not included: Cuba departure tax of $30.00 & baggage fees charged in Miami. We travel on a US Department of Treasury approved license and Visa. There are a limited number of seats available for this rare chance to visit this distinctive island. We encourage you to send in your deposit now. Leave the rest to our knowledgeable and capable guides!! 8days/8 nights. The first night will be in a Miami hotel which is included in this fee. First come, first served with deposit only! Signups no later than by Sept 20, 2012. Final payment & registration will be due by October 30, 2012 Non-refundable after October 30, 2012. In order to make your reservation and hold a space, we require a non- binding $500.00 deposit (Checks only please). We will confirm receipt via email. PO Box 4567, Key West, FL 33041.